OK, it's not exactly a holosuite, but it looks like the first real step in that direction. Ever since they first started appearing in Star Trek: The Next Generation, people have been asking when we'd get to enjoy holodecks and holosuites. Well, it only took a couple of decades, but it looks like technology is finally at the starting point of people enjoying virtual reality without any special outfits and goggles. Dubbed the "Immersive Cocoon", these are small, room-sized "spherical theaters" that not only surround their inhabitants with light and sound, but can detect their positioning and movements. Not only that, but aside from all the motion-sensing floor panels, motion-sensing cameras, and crazy interior display panels, the units will also include air conditioning. 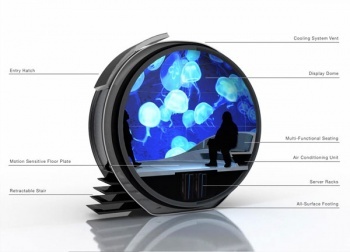 The Immersive Cocoon is the product of Tino Schaedler and NAU (a firm that does both design and advertising work). At the moment, the designeers are predicting that units will be installed in airports and malls and will be available for hourly rent with travelers and businesspeople who want to work in private or conduct a virtual conference. This is all well and good, but I'm still holding out for a system that'll let me engage in full on combat training exercises and James Bond adventures.